Mr. Wegener explains relevant biblical prophecies, showing how we are moving into the New World Order, but especially into the global government. He covers biological warfare, nuclear warfare, gun control , abortion, population reduction, war and deception of the people -- and much more using clips and news footage to support his points. 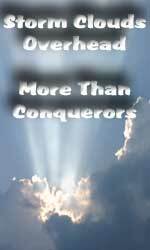 Wegener spends a lot of time on Scripture demonstrating to us how we can be "More Than Conquerors" in these troubling times. Dave talks about the kind of Christians we need to be for Jesus Christ.